To Cite: Moazzen Z, Eslami G, Hashemi A, Yousefi Nojookambari N. Efflux Pump Inhibitor Carbonyl Cyanide 3-Chlorophenylhydrazone (CCCP) Effect on the Minimum Inhibitory Concentration of Ciprofloxacin in Acinetobacter baumannii Strains, Arch Clin Infect Dis. 2018 ; 13(2):e59644. doi: 10.5812/archcid.59644. Objectives: Therefore, this study aimed at detecting multidrug-resistance and the role of efflux pumps in Ciprofloxacin resistance of A. baumannii strains isolated from burn patients. Methods: Eighty A. baumannii strains collected from 240 wound samples were isolated from burn patients hospitalized in the burn unit of Shahid Motahari hospital. Susceptibility to antibiotics was tested by disc diffusion and microdilution methods. Activity of the efflux pump system was assessed using the efflux pump inhibitor, Carbonyl Cyanide 3-Chlorophenylhydrazone (CCCP). Polymerase Chain Reaction (PCR) and sequencing were done for detecting the AdeABC genes. Results: Overall, 100% of A. baumannii isolates were resistant to ceftriaxone, ceftazidime, cefepime, cefotaxime, meropenem, ciprofloxacin, co-trimoxazole, piperacilin, piperacillin/tazobactam and imipenem; 72 (90%) to amikacin, 72 (90%) to gentamicin, and 0 (0.0%) to colistin The high increase of the susceptibility to ciprofloxacine in the strains in the presence of the efflux pump inhibitor was remarkable. In 25% of isolates, CCCP decreased the minimum inhibitory concentrations (MIC) by 4 to 64 folds. In 80 (100%) of the isolates, adeb, adeA, and adeC genes were detected. Conclusions: The results indicated the role of efflux pump in antibiotic resistance in A. baumannii isolates. Furthermore, A. baumannii strains could resist antibiotics by the efflux mechanism. Burns are damage to the skin, caused by different sources (1). Burn infection is uncertain thus it delays curing, continues scarring, and may cause sepsis, bacteraemia or multiple-organ dysfunction syndrome (1). Bacteria are important pathogens of burn wounds. After 48 to 72 hours of damage, these bacteria produce biofilms (2). The source of these organisms, include gut and respiratory flora, patient’s own skin, and contact with contaminated health care environments and workers. One of these clinically important MDR bacteria, prevalent in burn wounds, is A. baumannii (3). This bacteria is a non-fermentative gram-negative Coccobacillus species, responsible for nosocomial infections worldwide, such as bacteremia, pneumonia and infections of the urinary tract, bloodstream, and skin and soft tissue (3). Acinetobacter baumannii is a new threat to the burn patient population. It is commonly considered difficult to cure for many virulence factors and antimicrobial resistance genes (4). These virulence factor that contribute to its pathogenesis, include motility, adherence, biofilm formation, and iron acquisition. Also, membrane polysaccharide components, the outer membrane protein OmpA, penicillin-binding proteins, phospholipases, and outer membrane vesicles, have also been identified (5). These bacteria are usually resistant to a large range of antimicrobials, thus are problematic and difficult to eradicate. Resistance can be intrinsic, i.e. low membrane permeability and cephalosporinase, or acquired, i.e. transition of foreign genetic elements that render overexpression of efflux pump and can confer to the host multi-drug resistance (MDR) (6). In gram-negative bacteria, there are matchless pumps of resistance-nodulation-cell division (RND) superfamily. So far 3 RND systems have been identified, including AdeABC, AdeIJK and AdeFGH, that confer multi drug resistance in A. baumannii. The first pump, named AdeABC, causes resistance to tetracyclines, fluoroquinolones, chloramphenicol, aminoglycosides, and trimethoprim, and decreases susceptibility to tigecycline. AdeABC and AdeFGH render an essential role in acquired resistance. Expression of each pump is regulated by several mechanisms (6). Nowadays, the universal appearance of multi-drug resistant (MDR) bacteria has resulted in much difficulty for hospitalized patients, particularly burn patients at the intensive care unit (ICU) (6, 7). This study aimed at detecting antibiotic resistance and also the effect of efflux pump(s) in ciprofloxacin resistance of A. baumannii strains among burn patients, using the efflux pump inhibitor CCCP. From April to August 2014, 80 A. baumannii were isolated from 240 wound samples of burn patients hospitalized at Shahid Motahari Burn hospital, Tehran, Iran. Wound exudates were collected by swabbing, and immediately transported to the microbiology laboratory. These specimens was isolated, and identification was done according to standard procedures (8). The typical reaction of A. baumannii is glucose positive and oxidase negative, and negative to esculin, mannitol, indole, maltose, and H2S. Samples verified as A. baumannii were reserved in Tryptic Soy Broth, containing glycerol (20%) at -70°C (9). 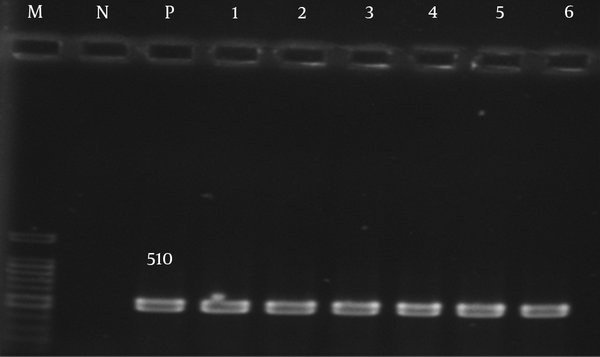 The PCR of the blaOXA 51-like gene was used to verify A. baumannii species (10). The following antibiotics were used, meropenem (MEM: 10 μg), ceftazidime (CAZ: 30 μg), imipenem (IPM: 10 μg), cefotaxime (CTX: 30 μg), amikacin (AK: 30 μg), ciprofloxacin (CIP: 5 μg), cefepime (FEP: 30 μg), ceftriaxone (CRO: 30), gentamicin (GEN: 10 μg), piperacillin/tazobactam (100/10 μg), and colistin sulfate (10 μg), all purchased from the mast company, Merseyside, UK. The turbidity of each bacterial suspension was adjusted equivalent to a number 0.5 McFarland standard and then inoculated on Muller-Hinton agar (Merck, Germany). The diameter of the inhibition zones was measured and the information was expressed as resistant, intermediate, and susceptible, according to clinical and laboratory standards institute (CLSI) 2015 (9). Escherichia coli strain 25,922 was used for quality control. All of the strains resistant to ceftazidime (CAZ:30 μg), meropenem (MEM:10 μg), and imipenem (IMP: 10μg), by the disk diffusion test, were re-examined in broth microdilution method based on CLSI, 2015 (9). Escherichia coli ATCC 25922 was used for quality control. To confirm the mechanism of efflux pump, the efflux pump inhibitor CCCP was supplemented to each of the M-H agar plates containing 0.5 to 128 μg/mL ciprofloxacin. The final concentration of CCCP in the M-H agar was 25 μg/mL (11). The MIC for ciprofloxacin was then measured again (12). The positive standard for the existence of efflux pump in the isolates was reduction of at least 4 folds or more of ciprofloxacin MIC after adding CCCP (12). 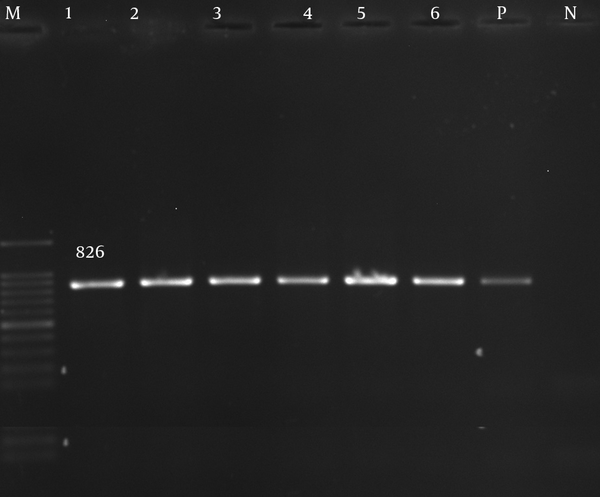 Genomic DNA was extracted from pure cultures using High Pure PCR Template Preparation Kit GeNet (Cat. No. K-3000, Korea), according to the manufacturer. The AdeABC genes in A. baumannii were detected by PCR. The primers used are listed in Table 1. 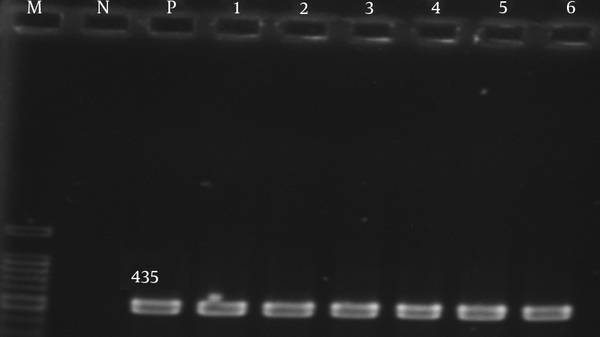 The 25-μL PCR mixture included 2 μL of sample DNA, 10 pmol of each primer, 30 Mm of KCL, 1.5 mM of MgCl2, 12 Mm of Tris-HCL, 250 μM of each dNTP, and 2 U of Taq DNA polymerase (Sinaclon CAT.NO:PR901638). Amplification was performed with the following thermal cycling conditions: 6 minutes at 94°C and 36 cycles of amplification consisting of 45 seconds at 94°C, 45 seconds at 50°C to 58°C, and 45 seconds at 72°C, with 5 minutes at 72°C for the final extension. Sequencing was done by the the Bioneer company (Korea). Overall, 80 A. baumannii strains were isolated from 240 wound samples of burn patients. Fifteen (25 %) strains were isolated from females and 45 (75 %) from males. The age range of the patients was between 5 and 68 years. The resistance rate of A. baumannii isolates to these antibiotics was as follows: 80 (100%) to cefotaxime, ceftriaxone, cefepime, ceftazi-dime, piperacillin/tazobactam, co-trimoxazole, ciprofloxacin, piperacillin, meropenem, and imipenem; 72 (90%) to amikacin; 72 (90%) to gentamicin; and 0 (0.0%) to colistin (Table 2). The MICs of ceftazidime, imipenem, meropenem, and ciprofloxacin for the A. baumannii isolates are presented in Table 3. To detect the role of the efflux pump in the ciprofloxacin-resistance of the 80 A. baumannii isolates, this study assessed the MIC of ciprofloxacin in the presence or absence of the CCCP (25 μg/mL). The results showed that in the presence of the pump inhibitor, MIC of most isolates was reduced in the presence of the efflux pump inhibitor (Table 4). All the A. baumannii isolates cultured in MHB, containing the CCCP (25 μg/mL) without ciprofloxacin, showed growth of bacteria, indicating that the CCCP (25 μg/mL) did not have an antibacterial effect itself. These results indicate that drug efflux systems contributed to resistance of ciprofloxacin in the A. baumannii isolates in this study. The adeA, adeb, and adeC genes were detected in 80 (100%) of the isolates (Figures 1 - 3). Lane M, 100 bp ladder; lane N, negative control; lane P, A. baumannii ATCC19606 positive control; lane 1 - 6, adeA gene positive isolate. Lane M, 100 ladder; lane N, negative control; lane P, A. baumannii ATCC19606 positive control; lane 1 -5, adeC gene positive isolate. Lane M, 100 bp ladder; lane N, negative control; lane P, A. baumannii ATCC19606 positive control; lane 1 - 6, adeb gene positive isolate. Infections may cause failure in curing of burns and are responsible for many problems, such as scarring and sepsis, bacteremia or multiple-organ dysfunction syndrome, and may lead to mortality and morbidity in weak patients (15). Acinetobacter baumannii has become a new threat to burn patients thus it is mostly successful at colonizing hospital environments. Several reports have confirmed that A. baumannii is difficult to cure since it has many of virulence factors and resistance genes that confer antibacterial resistance (5). The detection of A. baumannii strains from burn centers is recurrent and has been confirmed by various worldwide studies, including Iran (16). In this study, the resistance rates of the isolates was as follows: 80 (100%) to cefotaxime, ceftazidime, cefepime, ciprofloxacin ceftriaxone, co-trimoxazole, piperacillin, meropenem, piperacillin/tazobactam, and imipenem; 72 (90%) to gentamicin; 72 (90%) to amikacin, and 0 (0.0%) to colistin. In the present study, the best result against the tested isolates was obtained with colistin. Different studies have confirmed that the existence of resistant A. baumannii strains is increasing worldwide (16). These researches have also shown the resistance of these strains against B-lactamase, for example carbapenems, third generation cephalosporins and other antibiotic divisions, including aminoglycoside and fluoroquinolones. The other significance of these bacteria is linked to their multi-drug resistance, which limits their treatment. Asadollahi et al. during years 2009 and 2010 showed 100% resistance in A. baumannii isolates to ciprofloxacin (17). In this study, all of the isolates showed resistance to ciprofloxacin. However, resistance rate in the UK and China was lower than that of in the current study (50.9% and 61.2 %,) (14, 18). This diversity could be due to differences in the patterns of antibiotic usage and geographic conditions. Mohajeri et al. declared that all of the isolates were resistant to carbapenems (13). Fallah et al. reported that the resistance to colistin was found in two A. baumannii strains (1.8%) (16). Gholami et al. reported no resistance to colistin among the A. baumannii strains (19). Therefore, colistin could be useful in curing infections that A. baumannii cause, mainly in burn patients. Efflux pump systems are a major cause of multi-drug resistance (20). However, the overexpression of these genes among MDR isolates cause multi drug resistance yet the efflux pump alone cannot confer resistance among A. baumannii strains. Efflux pump inhibitors reduce this resistance in A. baumannii (11). The role of these compounds, for example CCCP, have been examined by some researches. Rajamohan et al. found that addition of CCCP at concentration of 25 μg/mL decreased the MIC of different biocides from 2 to 12 folds (21). Ardebili et al. found that most isolates (86.1%) became less resistant (2 to 64 folds) to ciprofloxacine in the presence of efflux pump inhibitors (11). On the basis of the results of Lin et al. (22), ciprofloxacin susceptibility of most isolates was increased in the presence of CCCP, by 2 to 8 folds. These results showed that multi drug efflux pumps play important roles in resistance to fluoroquinolone in A. baumannii isolated from hospitalized patients. Recently, results have indicated that resistance to antibiotics causes overexpression of this pump, including AdeABC (23). In the present study, adeA, adeb, and adeC genes were obtained from 80 (100%) of the isolates. The AdeABC efflux pumps were present in 80% (from 53% to 97%) of A. baumannii isolates (24). It is obvious from various studies (present and past) that the prevalence of A. baumannii strains resisting fluoroquinolones has increased in Iranian hospitalized patients. However, investigations of the current study showed that the drug efflux system has an important effect in resistance to fluoroquinolone in A. baumannii isolates and this mechanism is significantly increased among Iranian burn patients. Therefore, endeavors should be made for identification of such resistant bacteria and control of resistance mechanisms and providing better treatment agents against these organisms. The present study was financially supported by the research Department of the School of Medicine, Shahid Beheshti University of Medical Sciences (grant No 7835). 1. Baygloo NS, Bouzari M, Rahimi F, Abedini F, Yadegari S, Soroushnia M, et al. Identification of Genomic Species of Acinetobacter Isolated from Burns of ICU Patients. Arch Iran Med. 2015;18(10). 2. Trottier V, Namias N, Pust DG, Nuwayhid Z, Manning R, Marttos AJ, et al. Outcomes of Acinetobacter baumannii infection in critically ill surgical patients. Surg Infect (Larchmt). 2007;8(4):437-43. doi: 10.1089/sur.2006.029. [PubMed: 17883360]. 3. Zhu L, Yan Z, Zhang Z, Zhou Q, Zhou J, Wakeland EK, et al. Complete genome analysis of three Acinetobacter baumannii clinical isolates in China for insight into the diversification of drug resistance elements. PLoS One. 2013;8(6). e66584. doi: 10.1371/journal.pone.0066584. [PubMed: 23826102]. 4. Khoshnood S, Eslami G, Hashemi A, Bahramian A, Heidary M, Yousefi N, et al. Distribution of Aminoglycoside Resistance Genes Among Acinetobacter Baumannii Strains Isolated From Burn Patients in Tehran, Iran. Arch Pediatr Infect Dis. 2017;In Press(In Press). doi: 10.5812/pedinfect.57263. 5. Eijkelkamp BA, Stroeher UH, Hassan KA, Paulsen IT, Brown MH. Comparative analysis of surface-exposed virulence factors of Acinetobacter baumannii. BMC Genomics. 2014;15:1020. doi: 10.1186/1471-2164-15-1020. [PubMed: 25422040]. 6. Yoon EJ, Courvalin P, Grillot-Courvalin C. RND-type efflux pumps in multidrug-resistant clinical isolates of Acinetobacter baumannii: major role for AdeABC overexpression and AdeRS mutations. Antimicrob Agents Chemother. 2013;57(7):2989-95. doi: 10.1128/AAC.02556-12. [PubMed: 23587960]. 7. Erfanimanesh S, Hashemi A. Global Dissemination of the mcr-1 gene. Arch Pediatr Infect Dis. 2016;4(3). doi: 10.5812/pedinfect.38581. 8. Shahcheraghi F, Abbasalipour M, Feizabadi M, Ebrahimipour G, Akbari N. Isolation and genetic characterization of metallo-beta-lactamase and carbapenamase producing strains of Acinetobacter baumannii from patients at Tehran hospitals. Iran J Microbiol. 2011;3(2):68-74. [PubMed: 22347585]. 9. Clinical and Laboratory Standards Institute (CLSI). Performance standards for antimicrobial susceptibility testing; Twenty-second informational supplement. Pennsylvania, USA: CLSI; 2015. 10. Goudarzi H, Douraghi M, Ghalavand Z, Goudarzi M. Assessment of antibiotic resistance pattern in Acinetobacter bumannii carrying bla oxA type genes isolated from hospitalized patients. Novel Biomed. 2013;1(2):54-61. 11. Ardebili A, Talebi M, Azimi L, Rastegar Lari A. Effect of Efflux Pump Inhibitor Carbonyl Cyanide 3-Chlorophenylhydrazone on the Minimum Inhibitory Concentration of Ciprofloxacin in Acinetobacter baumannii Clinical Isolates. Jundishapur J Microbiol. 2014;7(1). e8691. doi: 10.5812/jjm.8691. [PubMed: 25147654]. 12. Pumbwe L, Glass D, Wexler HM. Efflux pump overexpression in multiple-antibiotic-resistant mutants of Bacteroides fragilis. Antimicrob Agents Chemother. 2006;50(9):3150-3. doi: 10.1128/AAC.00141-06. [PubMed: 16940115]. 13. Mohajeri P, Farahani A, Feizabadi MM, Ketabi H, Abiri R, Najafi F. Antimicrobial susceptibility profiling and genomic diversity of Acinetobacter baumannii isolates: A study in western Iran. Iran J Microbiol. 2013;5(3):195-202. [PubMed: 24475323]. 14. Shi WF, Jiang JP, Xu N, Huang ZM, Wang YY. Inhibitory effects of reserpine and carbonyl cyanide m-chloro-phenylhydrazone on fluoroquinolone resistance of Acinetobacter baumannii. Chin Med J (Engl). 2005;118(4):340-3. [PubMed: 15740676]. 15. Leseva M, Arguirova M, Nashev D, Zamfirova E, Hadzhyiski O. Nosocomial infections in burn patients: etiology, antimicrobial resistance, means to control. Ann Burns Fire Disasters. 2013;26(1):5-11. [PubMed: 23966892]. 16. Fallah F, Noori M, Hashemi A, Goudarzi H, Karimi A, Erfanimanesh S, et al. Prevalence of bla NDM, bla PER, bla VEB, bla IMP, and bla VIM Genes among Acinetobacter baumannii Isolated from Two Hospitals of Tehran, Iran. Scientifica (Cairo). 2014;2014:245162. doi: 10.1155/2014/245162. [PubMed: 25133013]. 17. Asadollahi P, Akbari M, Soroush S, Taherikalani M, Asadollahi K, Sayehmiri K, et al. Antimicrobial resistance patterns and their encoding genes among Acinetobacter baumannii strains isolated from burned patients. Burns. 2012;38(8):1198-203. doi: 10.1016/j.burns.2012.04.008. [PubMed: 22579564]. 18. Spence RP, Towner KJ. Frequencies and mechanisms of resistance to moxifloxacin in nosocomial isolates of Acinetobacter baumannii. J Antimicrob Chemother. 2003;52(4):687-90. doi: 10.1093/jac/dkg424. [PubMed: 12951327]. 19. Gholami M, Hashemi A, Hakemi-Vala M, Goudarzi H, Hallajzadeh M. Efflux Pump Inhibitor Phenylalanine-Arginine Beta-Naphthylamide Effect on the Minimum Inhibitory Concentration of Imipenem in Acinetobacter baumannii Strains Isolated From Hospitalized Patients in Shahid Motahari Burn Hospital, Tehran, Iran. Jundishapur J Microbiol. 2015;8(10). e19048. doi: 10.5812/jjm.19048. [PubMed: 26568800]. 20. Taherpour A, Hashemi A. Detection of OqxAB efflux pumps, OmpK35 and OmpK36 porins in extended-spectrum-beta-lactamase-producing Klebsiella pneumoniae isolates from Iran. Hippokratia. 2013;17(4):355-8. [PubMed: 25031516]. 21. Rajamohan G, Srinivasan VB, Gebreyes WA. Novel role of Acinetobacter baumannii RND efflux transporters in mediating decreased susceptibility to biocides. J Antimicrob Chemother. 2010;65(2):228-32. doi: 10.1093/jac/dkp427. [PubMed: 20008046]. 22. Lin L, Ling BD, Li XZ. Distribution of the multidrug efflux pump genes, adeABC, adeDE and adeIJK, and class 1 integron genes in multiple-antimicrobial-resistant clinical isolates of Acinetobacter baumannii-Acinetobacter calcoaceticus complex. Int J Antimicrob Agents. 2009;33(1):27-32. doi: 10.1016/j.ijantimicag.2008.06.027. [PubMed: 18790612]. 23. Marchand I, Damier-Piolle L, Courvalin P, Lambert T. Expression of the RND-type efflux pump AdeABC in Acinetobacter baumannii is regulated by the AdeRS two-component system. Antimicrob Agents Chemother. 2004;48(9):3298-304. doi: 10.1128/AAC.48.9.3298-3304.2004. [PubMed: 15328088]. 24. Coyne S, Courvalin P, Perichon B. Efflux-mediated antibiotic resistance in Acinetobacter spp. Antimicrob Agents Chemother. 2011;55(3):947-53. doi: 10.1128/AAC.01388-10. [PubMed: 21173183].